If you’ve ever wished you could schedule the opening of a specific file, or set an application to launch on a specific date, either on a one off basis or on a recurring scheduled event, you can actually do both right in Mac OS X with the help of none other than the default Calendar app. This is an astonishingly useful feature that is largely unknown, but it’s extremely easy to use. We’ll cover how to launch specific files on a schedule, or just an application. Just like a standard alert or event, you can create repeat schedules with these as well. If you’ve ever created a generic event or Reminder in OS X before, this is quite similar. Use the “Repeat” function to set the file to consistently relaunch on the given date and time provided. These can be standard, or custom repeating schedules like every last Friday of the month. The repeat feature is an excellent additional trick for repetitive tasks that use the same file, like a weekly or monthly earnings report, tax document, expense sheet, or whatever else requires regular use on a scheduled basis. Once the date arrives, the selected file will launch automatically in the default application at the date and time specified in Calendar as the alert. Because it uses the default app, you would have to change the file-app association to adjust which app the file opens in, or just go the route of having the alert launch an application directly instead. Keep in mind that with OS X’s newer ability to restore saved windows, documents, and application states, that just setting an application to launch will open the app with all documents last used available. That will happen unless the feature has been disabled manually. This is different than using the “Open File” trick outlined above, which will open the specified file instead. These scheduled events will sync with iCloud to other Macs and iOS devices, and though the iOS devices will get an alert on those days if one has been set, the app-opening ability will only work on the OS X side of things as iOS doesn’t (yet) have a similar functionality built into it’s alerts. Interestingly, iOS does have the ability to create the custom repeat Reminders through Siri though, suggesting it wouldn’t be terribly difficult for Apple to include this very useful ability in iOS down the road if they chose to. This is a great tip and one that I’ve used in the past. There is a downside though and it’s this: If you have more than one Mac and it’s synced to your other Mac thru the Cloud, both Macs will preform the same function. For example, I used this tip to open up all my applications I use at work on my work computer before I got there in the morning (just to save time). However, all those same apps opened up on my home Mac at that same time and I didn’t want that to occur. Then, when my kids got on the computer in the morning they were screwing up all my work apps. I had the same problem, minus the kids. Is there any way to create a local calendar? Any new calendar defaults to iCloud. Found out how to make an ‘On my Mac’ calendar in, er, Calendar. Unselect any iCloud calendars in the left bar. If you have a subscription calendar, select that. If you don’t have a subscription calendar, hide the iCloud calendar list by mousing over the iCloud heading then clicking on ‘Hide’. Right-click in an empty area of the left column and select New Calendar. 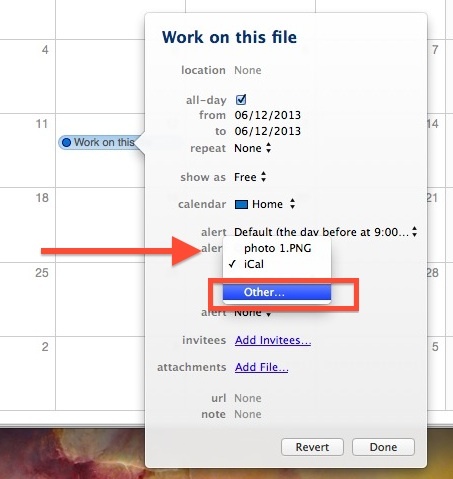 This automatically creates a new local ‘On my Mac’ calendar. 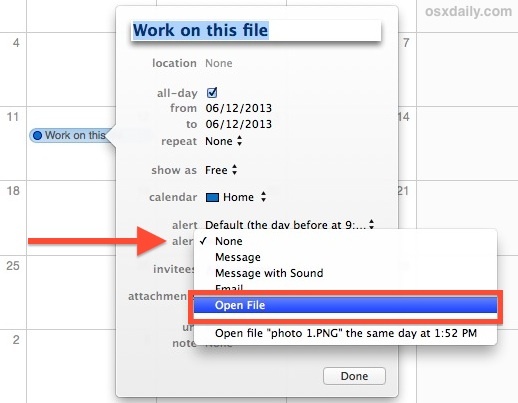 Name it, and create any file or application alerts in this calendar. Has this worked for anyone in Mavericks? I have tons of automator items connected to my calendar to get things done at work while I am away. Everything broke down, when I upgraded. Any suggestions? This has also stopped for me. Any ideas how to get it to work in Mavericks? No idea how to edit existing in Mavericks, but I have just tried to set up a new event to open an app. Change ‘Calendar’ to ‘other’ then select the app from the finder window that opens. *note in attempting to replicate this, I had to quit calendar to get the finder window to open for some reason. This is useless on Yosemite too. Set up a repeating event to open a particular file EVERYDAY, and it only runs once, then OS X, like a politician drops the file from the reminder the next day. EVEN THOUGH I check each event over the next two weeks to ensure it followed through! Any idea how to set calendar to quit the app later in the day(without having to use Automator app)?